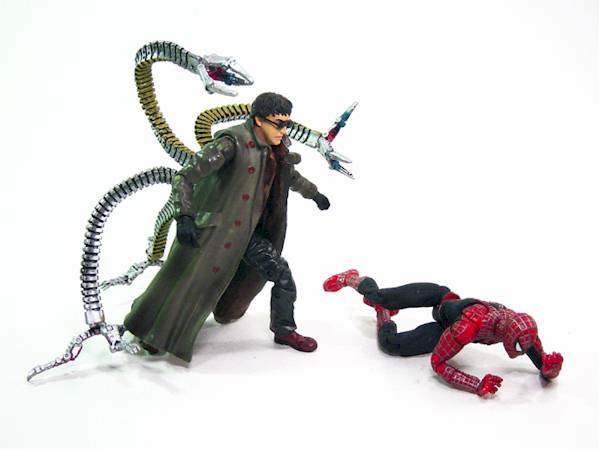 Coheteboy checks in with a review of the second version of the Doctor Octopus figure from the Spider-man 2 line. I reviewed the earlier version when it hit awhile back, so this is a great review to compare. It's all yours, CB! 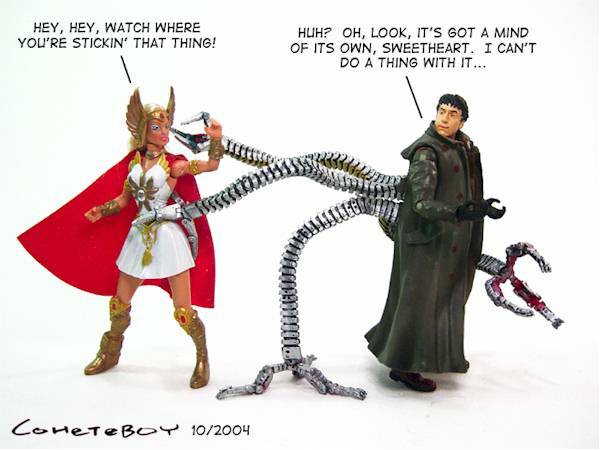 As if Toy Biz made it hard enough to get your own tentacles on the first Doctor Octopus figure (also reviewed by Michael here) from the Spider-Man sequel, you're in luck! Almost! 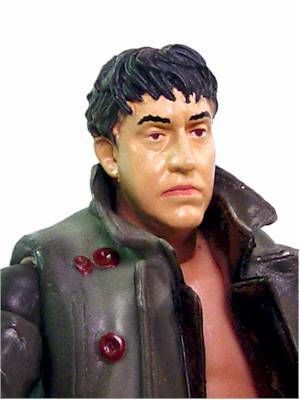 If you were never able to grab hold of Alfred Molina in plastic the first time around, be glad because the second one is the version to get, in my opinion. Not to say that this is the supreme Doc Ock figure, but as far as toys in this scale goes, it's as close as you can get for now. Yuck. When new toy lines hit the toy shelves for the very first time, it's a welcome change. But this packaging: gold and dull, is wearing out its welcome. ESPECIALLY because none of these web-head figures are selling! Anyway, what you're getting is a standard card with bubble. And at least there are some instructions on the blister card to how to get your figure going. Would be nice to have some sort of photo reference to the actual movie but that isn't found here. 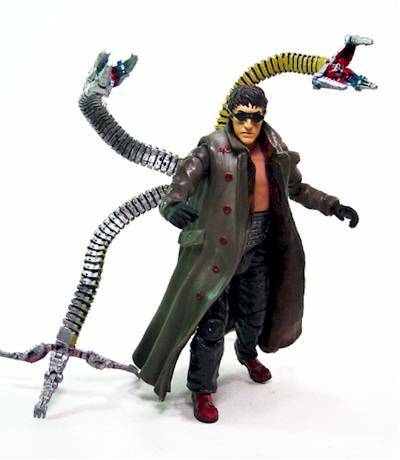 For those trying to figure out the difference between version 2 Doc Ock, look for the Doc Ock figure with the tentacles detached on the side of the bubble. Version 1 comes with the tentacles permanently fixed. Both read "Doc Ock" though, so look carefully before you run your way to the cash register. If you liked the head sculpt of the first version, the new version is a LOT better. I actually never cared for the first since he looked way too sad and pathetic to do any damage. New version is improved tenfold with a more determined expression. The rest of the body is near identical to version 1 so nothing new to report. Here's where version 2 takes a step down from version 1. The first Doc Ock had more detailed facial details, whereas the new is a rather dull skin tone with no 4 o'clock shadow or anything of the sort. The coat is given a darker shade of army green this time around, and is probably more accurate. The best part of course are the tentacles, which has a nice shiny metallic finish. Great job here. 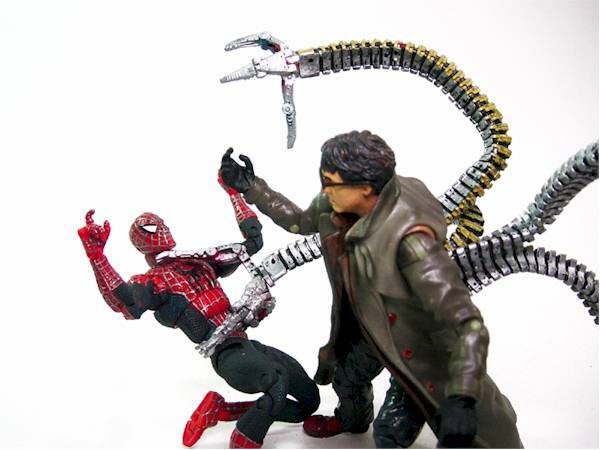 While the first Doc Ock boasted 30 points of articulation on the packaging, it actually had far more than that. From my count, version one has about 60 points of articulation if you really get down and dirty and include all the claws as well. Version 2 Doc Ock probably has about 25 points of articulation in the figure itself, 53 if you count the tentacles and claws. Not that huge of a difference but it's certainly a trade off. 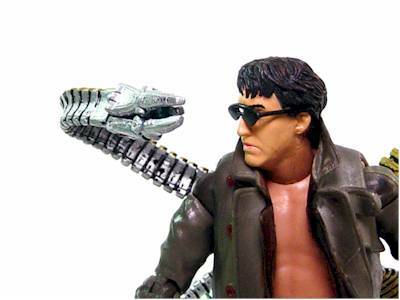 What's different about version 2 Doc Ock is the removal of several awesome points of articulation. I'm quite curious as to why they cut down so much from version 1 because it is noticable. -Version 1 has two points of articulation in the elbows, version 2 only has one. -Version 1 has articulation in the fingers, version 2 does not. -Version 1 has extra articulation in the calf below the knees, version 2 does not. -Version 1 has articulation in the shoulder/pectorals for better rangewith the arms, version 2 does not. 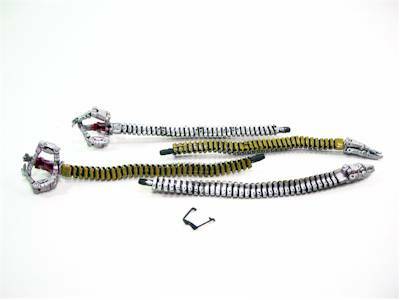 But what version 2 DOES have that version 1 doesn't, are fully articulated and bendable tentacles. This will either seal the deal or break it for you. 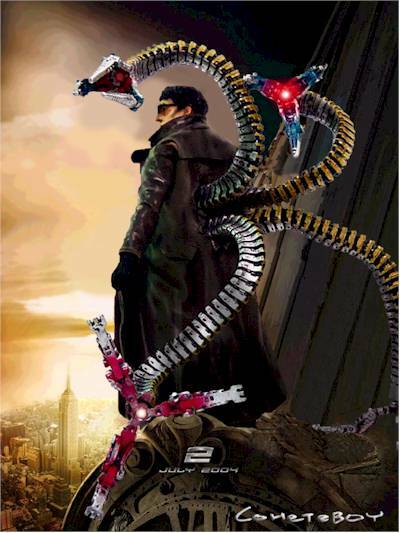 Would you rather have a super articulated Otto Octavius? 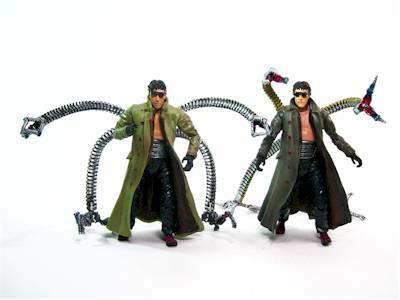 Or would you prefer a decently articulated Doc Ock but with superior articulation in tentacles? You decide! 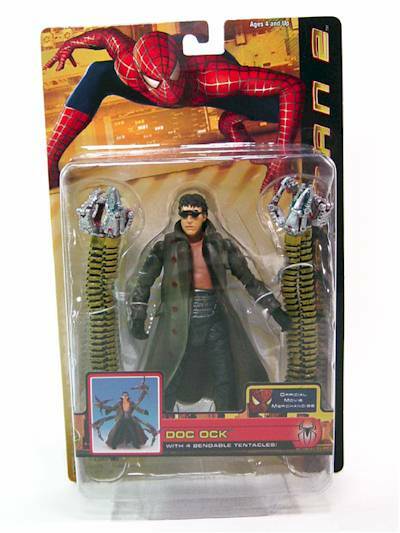 Like the first release, Doc Ock comes fully equipped with shades. But this time, they're even better. The shades have pegs so they could be plugged into his head for better stability. This is a great idea since the holes are hardly noticeable and the shades now stay on quite well. Version 1 Doc Ock's shades got to the point where they fell off from any hint of movement. This is definitely a step up. 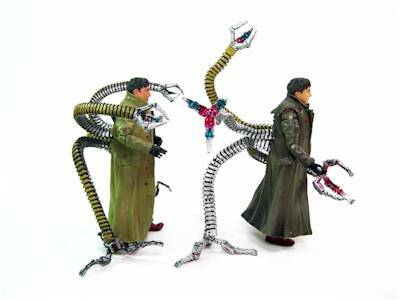 New Doc Ock also features removable tentacles with fully articulated claws. This is definitely a far better set of accessories than version 1. 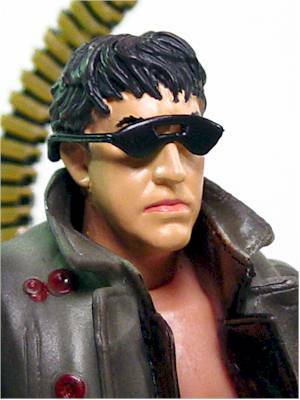 What would have been nice though would to have a hat for Doc Ock. I'm pretty sure that I saw him wearing one in the film, so that would have been nice here. 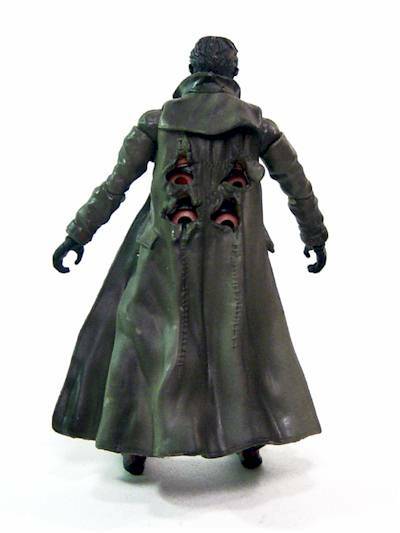 I think I'm also in the minority of wanting Doc with a fabric trenchcoat for even more poseability. But until then, this is a decent set of pack-ins. My biggest complaint however, are that the tentacles are WAAAAAY too short. Have you seen the movie lately? HIs tentacles walk for him, crawl up the wall, punch people several feet across the room. These rinky dink tentacles really don't go very far at all. It's a true shame that they were THIS close to being perfect. Considering that his tentacles could actually be posed this time, I'd say the fun factor should be a lot higher than the first Doc offering. Trading some cool bendie tentacles for extra articulation? I'd do it. JUST $7 RETAIL!! You can't get any better than that really. But of course, this sucker is going to be hard to find seeing as he's short packed, and the only new character among the sea of Spidey figures. Honestly, this figure really is a three and a half star toy, but I just can't be too much generous when I know exactly what's holding it back. First up are the points of articulation that COULD have been applied here. We've all seen how articulated the first version was, and knowing that he was toned down just for this release is a bit disappointing. Also, I made note of the tentacles being too short. 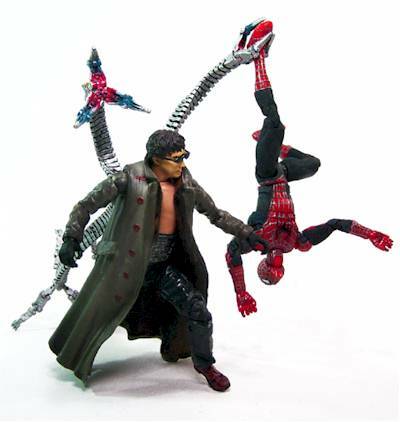 I really would have loved to be able to pose Doc Ock in much more menacing poses, but when they can't reach further than his own arms could, you really can't do anything with them. But despite all of those let downs, This is a superb action figure. A more incredible sculpt, and bendie tentacles really make this the villain worth fighting for. But there's always that version three in the pipeline... but seeing how hard to find these are, it's probably a good idea to pick this guy up anyway. I picked this one up at Toys'R'Us for $6.99. It's rather surprising that they got new stock at all with so many web-heads warming the pegs! Figure from the collection of Coheteboy.